Prepare yourself for a couple of euphemisms. I have been watching a few historical dramas lately. For example, I am catching “Little House on the Prairie” almost every afternoon. Let me rephrase that so I sound less pathetic. “Little House On the Prairie” is on all the time and I watch sometimes. I am also watching “Bomb Girls”, “When Calls the Heart” and, of course, I was an avid “Downton Abbey” viewer. I was saddened almost as much by the cheesy series finale as I was by the fact that it was the last episode ever. It is fun to imagine living in different eras, but the fact of the matter is that I would have probably kicked the bucket (euphemism one) by now if I lived in another time. There is also a small chance I could have not passed away (euphemism two) if I lived in a different period. Undoubtedly, I could have lived, but far less comfortably. There obviously would not be a blog, and there would definitely not be a power wheelchair in the 19th century, the 1930s or the 1940s. While we are on the topic of media, I finally got around to watching “My Beautiful Broken Brain” on Netflix. 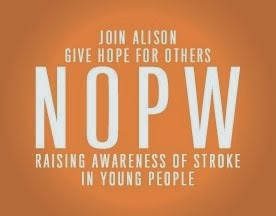 While I thought it was good that it brought awareness to stroke in young people, there were too many missed opportunities (euphemism three). I think it is important to mention that there are many other telltale signs of stroke and ongoing side effects. The filmmaker chose to show her journey and no one else’s. And for those of you who needed to look up the meaning of euphemism, it could be said that you are missing a few crayons in your box. But not really, because you are reading my blog. I always wondered what it would be like to live in a different era as well and how different my life would be. Hope to see more inspiring posts from you soon Alison.